The temple complex of Besakih (pronounced bee-sock'-ee), spread over the slopes of holy Mount Agung, is the holiest and most revered in Bali. While some form of worship has undoubtedly been carried out here since very early times, one anchor date is the early 15th century, when the rulers of Gelgel and its successor states established their ancestral shrines here. Since then, the site and its temples (22 major, and uncounted minor, ones) has been under continuous worship, construction, and refurbishment. 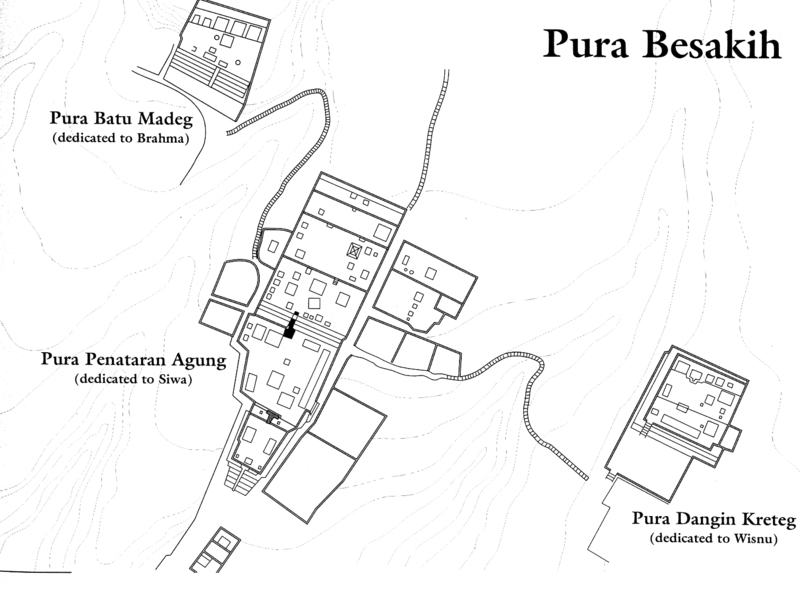 In this overview photo, the temple on the right is Pura Basukian (later page); the photo left shows, in the background, the lower terrace of the central complex (following pages).